Drought occurs widely and frequently in China, causing considerable damage to the living environment of humans. The Yellow River basin (YRB) of China shows great vulnerability to drought in the major basins; thus, drought monitoring in the YRB is particularly important. A recent study reveals the temporal and spatial characteristics of the multi-scale drought in the Yellow River basin over the past 55 years. The research paper, written by Professor Yang Haibo of the Zhengzhou University, is titled "Study of the temporal and spatial patterns of drought in the Yellow River basin based on SPEI," and was recently published in Science China: Earth Sciences. The extreme-point symmetric mode decomposition (ESMD) and Bernaola-Galvan segmentation algorithm (BGSA) were used in this study. The annual and seasonal variation, frequency and intensity of drought were studied in the YRB. Influenced by geographical location and the East Asian monsoon climate, the hydrometeorological conditions of the YRB are complicated and varied. With a deficiency of water resources and disequilibrium of the precipitation distribution, the YRB is the area most vulnerable to drought in the major basins of China. Therefore, drought monitoring in the YRB is particularly important. It is necessary to clarify the various drought-stage characteristics in the temporal scale, especially under the fluctuant drought variations caused by climate change in recent years. The YRB spans a wide range of 23 longitudes and 10 latitudes. Different climatic types and topographic features lead to obvious differences in the spatial distribution of drought in the YRB; thus, it is necessary to study each subzone in the spatial scale. In this study, the latest ESMD was applied to the time-frequency decomposition of the meteorological drought index SPEI. Drought periods with 2.9, 5, 10.2 and 18.3 years were characterized by ESMD. The BGSA can be used to divide the long research period with the obtained variability of each mean segment. And three stages (1961-1996, 1997-2002 and 2003-2015) were detected by BGSA. Yang concluded that the most serious drought happened in the middle stage (1997~2002 years). After the spatial interpolation from the original station data, the raster-based SPEI were obtained to calculate the drought frequency and intensity. It is more continuous and precise in the spatial scale compared with the direct interpolating value from station-based results. The sequence of drought frequency was summer, spring, autumn and winter with mean values of 71.0 percent, 47.2 percent, 10.2 percent and 6.9 percent, respectively. And the sequence of drought intensity was summer, spring, winter and autumn with mean values of 0.93, 0.40, 0.05 and 0.04, respectively. The paper identified the spatial and temporal patterns of drought in the YRB for the last 55 years, and put forward the targeted drought resistance measures according to the characteristics of the YRB and the various subzones, which provided reference and basis for the monitoring and early warning of drought in other areas. The research results enrich the study of drought in the YRB. 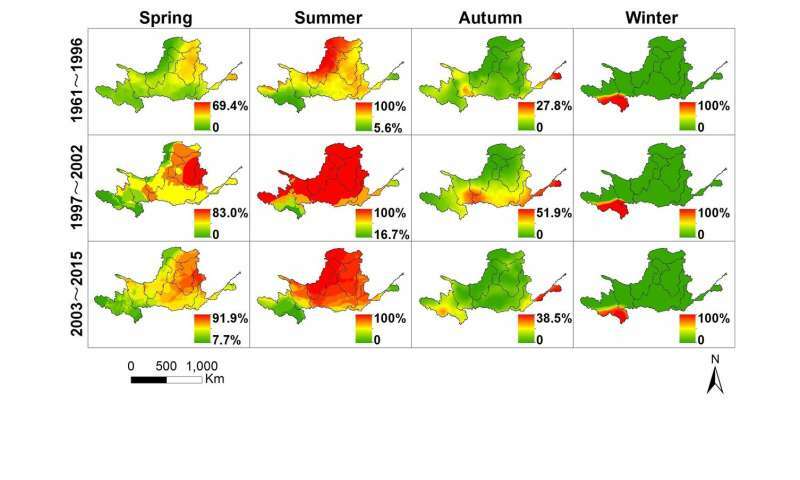 The temporal and spatial evolution patterns of drought in the YRB were analysed in detail to provide a scientific decision-making basis for avoiding drought disasters, and to produce greater practical significance to study the evolution and scientific development of drought in the YRB under the changing environment.